Today begins our painting contest Creature Feature! A few reminders as we begin. - In order to maintain anonymity the miniature cannot have been displayed in any forum elsewhere on the internet or published mediums such as magazines. All contest entries will be displayed anonymously so as to give no one person an unfair advantage (this isn’t a popularity contest) and thus there can be no signatures or watermarks upon them. This includes naming the photo or file. No announcing on forums, webpage, blogs or any other type of medium about the type of miniature that you will be painting, nor concept or WIP photos. - The model must remain in theme! This means the most ferocious creatures you can find. Fangs and claws abound! The figures must be clearly NOT HUMANOID. Now you may be thinking to yourself "But what about..." Well we have provided this useful graphic for all your Monster Identifying needs! Now if you still aren't sure after following our handy dandy flowchart, please send me a message! Otherwise you might get disqualified. And nobody wants to get disqualified. If the model does not fall in theme, it will be removed from the contest. 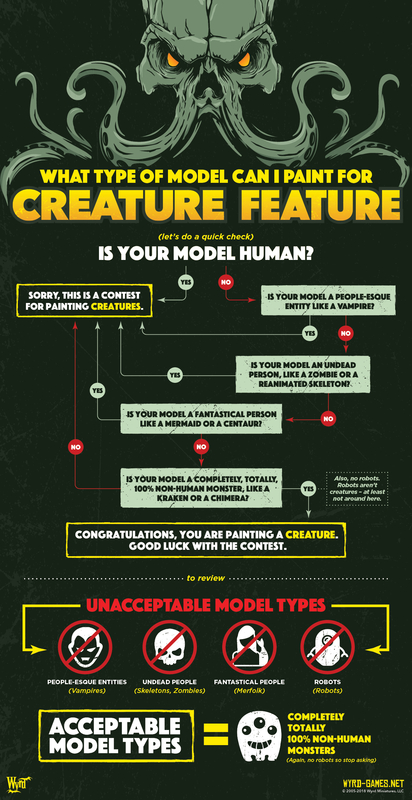 - You must follow all the rules as outlined by the Wyrd Painting Contest Rules. The rules can be found here. Again questions should be directed to me (Kai). - Submissions begin today April 2nd and run until midnight (EST) April 22nd. Any submissions made AFTER Midnight (EST) April 22nd will not be considered as a part of the contest. This means they will NOT be posted and they will NOT be eligible to win. - Voting will begin on April 23rd and end on April 25th. Voting is done by the community. The contestants are kept anonymous in order to make the process as fair as possible. - Winners will be announced on April 27th. To participate all you have to do is submit an image. This should be either into the single model category, or the diorama category. Single Model: This is where you will submit your piece. Remember that a single model entry should be one model, set on an appropriately sized base. This is not a scene. Diorama: A diorama entry contains more than one model and often a much more complex base. You are allowed to enter into, and win in each category. *Art Design will work with our in-house artist on a visual for a character that fits the theme of the contest that they won. You will be able to provide a brief description of what you’re looking for. It must fall within the visual standards that are set for the Malifaux play-verse (Malifaux, TTB, ToS). This does not give you the rights to the art. Wyrd Miniatures, LLC reserves the rights to use the art in future publications. 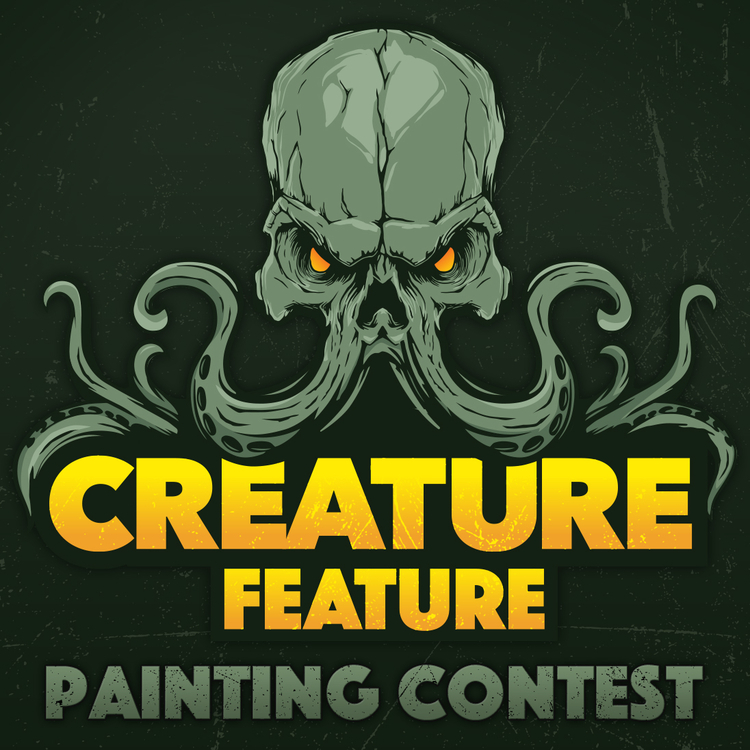 Now, get your brushes ready, the paint flowing, and show us what you got! Falls under "fantastical person" as the top half is a person. Found answer in another Thread. Please delete. If pig has a rider - it can participate? Mature nephilim falls under fantástical person? And Nekima? Would need to not include the rider. Mature Nephilim is a yes. Nekima I'm going to talk to some people. I'm gonna go no to Nekima. Ice Golems-Gamins is a yes? also what about festivus arborus ( the tree), it is not an ice golem but a woodland thing of a thing. I'm going to say festivus arborus is fine. ONLY ONE PICTURE PER MODEL CAN BE SUBMITTED. Will a collage be okay? Yep! The thing is if you submit multiple images we can only use one in the voting. So we need only one image so we use the right one! Cyclops? Or are they just giant one eye'd people? The Beast Within? He can be a person... So no? Cyclops is a no go. Beast Within is fine, Vogel is NOT. Hi - I have a question about ridden monsters. Will this be allowed? I have a full fledged monster, with a tiny rider on top...the rider is built-in so no chance to remove it. No humanoids allowed. So riders are out.